I’m trying to keep things fresh, interesting, tasty and fun for Peyton when it comes to lunch time. Plus we smushed the bread on the way home. So, this week we’ve been doing a lot of “sushi” rolls for sandwiches. It’s a great way to take smashed bread and use it. Simply take a rolling pin, roll out the piece of bread and trim the crust off. Now you have your “sushi” roll base all ready to go. Today I took a little Nutella and sliced banana to make the main dish. Just remember to slice the bananas think and the spread on the Nutella thin. You have to roll these and if it’s too bulky everything will just fall out. Next, I added some fresh blackberries for a fresh fruit. We had some red, yellow and green pepper strips sliced up in the fridge so I cut them into chunks and tossed them in the bento box. Trail mix is full of nuts and protein so I added a little of that too. And then for her treat, Peyton got a quarter of a sliced up strawberry donut. There is plenty in the bento box for lunch. 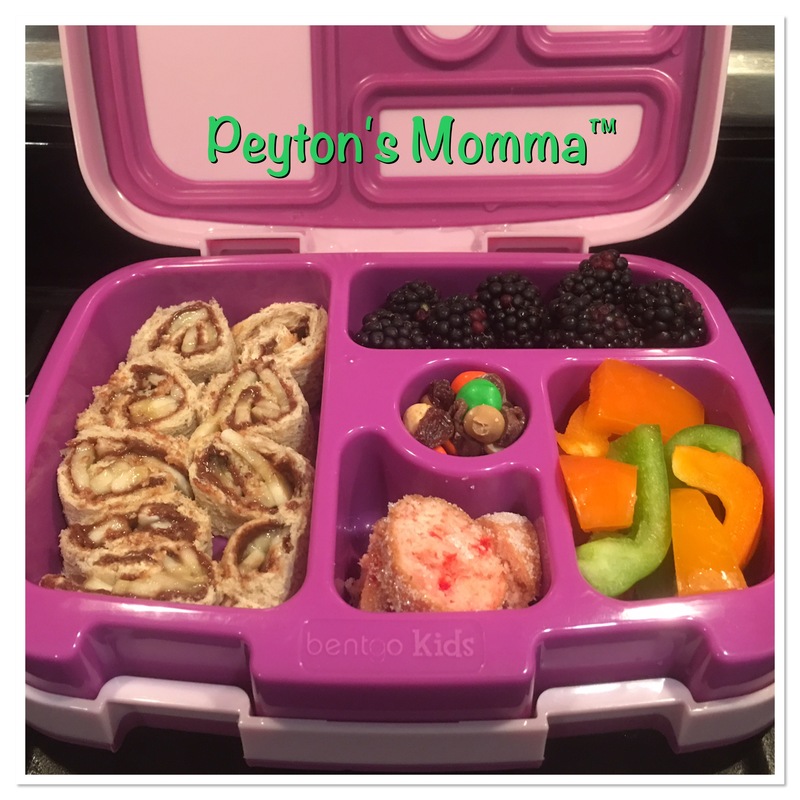 Actually, it’s more than Peyton can eat during lunch so she often eats the remainder at snack time or on the way home.